Many attorneys graduate from law school already burned out and ready to quit before they begin their career. But if you’re the sort of person who wants to help people with their problems, think twice before suspending or ending your law career. At the same time, some lawyers are unfit to practice law. Others, however, have a genuine interest in helping people and continue practicing law for that very reason. Summary: Learn if you are the sort of attorney who should quit practicing law—you may very well be. By the time many attorneys get out of law school, they are so tired and burned out due to years of high pressure that some have already given up: They want to collect a paycheck and start working and living their lives—on their terms. Many attorneys talk about “going in-house” and other low stress jobs before they even start their jobs in large law firms. Incredibly, more and more attorneys give up before the race even starts (or is just slightly underway). Most of the world is not made up of large law firms: If you care about other peoples’ problems and the work you do for them, the last thing you should be doing is plotting your escape from practicing law a few months (or even years) after working in a large law firm. You should, instead, be plotting how to find a better environment for your skills. There are some people that are cut out for practicing law—regardless of where this is. These people should never quit. Saying you want to quit practicing law because you do not like working for a large law firm is like saying you never want another friend because your best friend was mean to you. That is insane … but it is precisely what many good attorneys do who have had a bad experience in one law firm. Large law firms are industrial organizations and a relatively new breed in a profession that is thousands of years old. Attorneys should go to law school because they want to be attorneys and not because they want to work in giant law firms. Being an attorney is an entirely different thing than an anonymous drone trying to rise through the ranks in a monolithic organization. The most highly-qualified attorneys give up practicing law more often than lesser-qualified attorneys. The odds are very good that if someone went to a top law school and practiced with a top law firm then they are more likely to give up a few years into it than someone with lesser qualifications. In contrast, if someone starts out in a smaller law firm, they are more likely to be practicing law 5, 10 or more years out of law school. Why the discrepancy and why do the people with the most potential for practicing law often give up? There are a lot of reasons for this and I will discuss them below. Some of the reasons for this are good ones and others are bad ones. If the attorney’s reasons for leaving are good, then they probably should quit the practice of law. If they are poor ones, then they should not. The biggest issue I see is that attorneys leave the practice of law for the wrong reasons. Attorneys should only quit practicing law if they are unfit for it. In contrast, attorneys should not quit practicing law if they are in the wrong environment. Most attorneys quit practicing law because they are in the wrong environment. 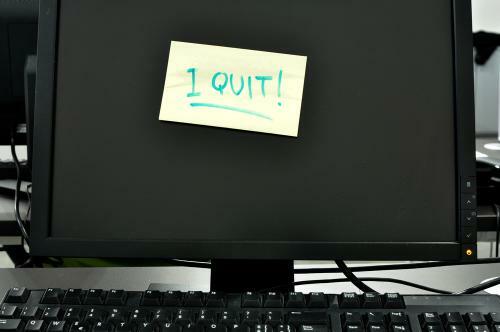 Have you ever thought about quitting the practice of law? Why? Does solving your clients’ problems get you excited? Do you think about your clients’ problems when you are not working? Does time “seem to fly” when you are engrossed in solving someone’s problem or advancing their interest? Does practicing law feel “natural” to you—i.e., would you do it even for far less money? Do you constantly wish you had more time to make your work product better? Do you get emotionally involved in the matters you are working on and want to “win”? Are you interested enough in what you do that you would like to write, speak and read about it in your free time? An attorney who is not fit to practice law generally does not care about many of these things at all. They are not overly concerned with the quality of their work or their clients. If you feel yourself putting on an act with any of this stuff, you should get out now. You have very little business being an attorney. Regardless of your practice area, it is important that you are interested in the work you are doing and see it as important and something that motivates you. Being an attorney is not about you—it is about protecting other people and doing everything you can to make sure justice is served and the other person is helped. This understanding should be natural, visceral and something that motivates you in all respects. If it is not, you should not be practicing law and should leave now. If working a weekend or 18 hours a day is necessary to help your client win, you should do it—and want to do it. If traveling across the country interviewing witnesses to get a certain piece of evidence is necessary, you should do it—and want to do it. Being an attorney is not about you. It is about your client and making sure they get what they want and that they win. This understanding is so fundamental and important that if you do not have it—or care what happens to your client—then you should not be an attorney. A policeman who does not defend the helpless, or care about it, should not be doing police work. A doctor who does not care if her patient lives should not be a doctor. A fireman who does not care if a building burns down and people die should not be a fireman. An attorney who does not care if his client gets taken advantage of, or is prosecuted improperly, should not be an attorney. See Play Each Day Like It is Your Most Important for more information. Who would you want representing you? Some guy that looks good in a suit, is condescending to you and works when he wants and on his terms, or someone who devotes himself to your case and thinks it is the most important thing in the world? People that should be practicing law take their work product extremely seriously. I’ve seen attorneys kick a trash can across the room when they find a typo in a document. I’ve seen the best attorneys spend two days in bed when their client loses an important case. These are the people that should be practicing law, and they have the “spirit” within them that makes them completely fit for doing this. The best attorneys never retire! That is the last thing in the world they would want to do. Helping people and advancing their interests is too fundamental to who they are. This “spirit” that makes good attorneys cannot be measured by your LSAT scores, law school grades, the quality of the law school you went to, or the law firm you work at. In fact, some of the most successful attorneys out there went to the worst schools and may have had the lowest test scores. Yet they are the most successful attorneys. They are personal injury attorneys with their own private jets and the people you see on television and in the news. They have this spirit and drive and it is precisely why they are successful. Law schools are primarily factories that are producing standardized goods without the capacity to measure what really matters: Whether the person is motivated by other people’s problems and issues. Do you consider yourself a good attorney? Why or why not? What are test scores and grades anyway? All they really exemplify are ways that society packages and rates various goods that are produced for consumption by the mass market (law firms, who are in turn consumed by companies). This is sort of like the way wines are ranked an “85” or a “92” and this influences their value. An attorney could be compared to a “wine” with a rating. This wine is purchased by a restaurant (the better the restaurant the better the wine it buys). This wine is then used by a company. The better or richer the company, the more expensive restaurant it visits with the more expensive wine (i.e., more highly qualified attorneys). While the “ranking” of an attorney may influence the attorney’s “value” to an employer, this never in the long run influences the attorney’s “value” to the client. The value to the client is determined by what is inside the attorney and what is motivating them. When I see an attorney without this motivation to help clients, I rarely work with that attorney. This type of lawyer is a “flash in the pan” that is in the wrong place and has gotten through the system to where they are but will not remain. You cannot do work that does not interest you or that you do not care about. This is not right and it never works out. In my experience the attorneys that are not fit to practice law are the attorneys who are not interested in the work and are unable to take their clients’ problems as seriously as they would take their own. This attorney is not fit for practicing law because they make the practice of law more about them than the client. If you truly care about the work you do, then you should never quit practicing law. The best attorneys love what they are doing and take it extremely seriously. They are motivated by helping other people solve problems and doing so in the most effective manner possible. The other day I received a telephone call from someone who had started his career at a top law firm. Then exactly one year into his practice, he quit being an attorney and started some sort of small company that ended up failing. One year later, the attorney was out of money and interested in relocating out of a “high pressure city” and finding a mellow job in a law firm in a smaller city. The attorney (like all attorneys) was talking about the need for weekends, being able to leave “at 5:00 or 6:00” and so forth every day. These calls from attorneys are quite common and there is nothing wrong with not wanting to work hard. Not every athlete wants to be in the Olympics—nor should they want to. “I just want a normal law firm job,” he told me. “You do not want to have to work weekends if one of your clients is selling a company and the work needs to get done?” I asked. This attorney should not be practicing law—at least in a law firm. I told him this. He has no interest in the work, helping clients, or being an attorney. His priorities are about him and that is fine. There are countless professions for someone like this, but would you want him protecting your interests? I sure as hell would not. See Parking Benefits and Falling in Love with Your Job for more information. I speak with attorneys all day and can generally quickly tell the attorneys that are not fit for practicing law, because all they talk about are themselves. You are, of course, expected to have wants and needs—and be a person—but being an “advocate” means you care about protecting and advancing others’ interests. This is what it is all about. The more someone talks about their work, their clients and what they like about it, the more fit they are for practicing law. It is like that with every profession. You want people representing you who care about you, where you are coming from and what is important to you. There is no way you ever, ever should quit practicing law if other peoples’ problems get you excited and motivated and you want to solve them. You are fit to practice law – no matter what others around you may lead you to believe. This is something that is “natural” and that no one can teach you. You either have it or you do not. Some people are natural athletes, others are math geniuses, some are naturally social. If you are motivated by other peoples’ problems and the quality of work you do on their behalf—truly motivated by them—then you are in the right profession. There is no question about it. The last thing you should ever, ever do is quit practicing law. The world needs you. Do other people’s problems excite you? What is the hardest problem or case that you have worked on? When I was in law school I was dating a girl from a small town in Pennsylvania. I became close with her family and they arranged an interview for me with a small law firm in the town. I had a meeting that was unlike anything I have ever experienced before or since. The law office was in a home that was several hundred years old and furnished with various antiques. I met one attorney who had to leave at 4:00 to go coach his daughter’s soccer practice. I met another attorney who had just returned from a two week trip to Costa Rica. The offices were large and homey. A few had fireplaces in them and nice oriental rugs on the floor. A few of the attorneys spoke about a local country club they belonged to. As my final interview concluded (it was now 5:30), I realized that over the last 30 minutes or so I had heard the creaking of the stairs and luxury cars starting in the parking lot as everyone in the office left for the day. The law firm had not hired anyone in years and most of the attorneys had been at the firm for their entire careers. Several of the attorneys spoke about community-oriented things they were involved in (Chamber of Commerce and so forth). The attorneys seemed well-balanced and happy in all respects. The law firm represented lots of important local clients (a hospital and a few other businesses) that generated plenty of work. They represented people who got in trouble and businesses that needed help with transactions. The work was stable, profitable and something the attorneys enjoyed. They also had lives outside of the office and did the work that needed to be done to do a good job and nothing more. They were not concerned about needing to have associates work crazy hours to pay crazy salaries, or pay for crazy expensive office space. They were operating a stable, normal law firm. The sort of law firm that has existed in one form or another for hundreds of years, when lawyers were lawyers and had not been turned into industrial, profit-producing and expendable machines. Although I did not know it at the time, this was the greatest opportunity I ever had to be happy practicing law! It took finding a small bucolic town in Pennsylvania with Amish people driving down the street in horse drawn buggies to find it, but I did! It was as if I was being offered a gift of what being an attorney could be: a respected profession, with leisure and a nice work environment with peers who worked together happily. It was something that I would never see again. Do you know anyone that works in this kind of law firm? Is this kind of environment appealing to you? This, of course, was hardly the sort of law firm that that I ever imagined I would be working in. These attorneys all went to law schools I had never heard of. I knew the law firm would hardly have any plans to offer me the sort of salary I felt I was entitled to and deserved. I certainly thought I was better than this. I think it is a law of the universe that every attorney encounters a job that is perfect for him or her at some point in his or her career—and most attorneys turn these jobs down. I have seen it more times than I can count and it is frustrating and upsetting. It generally turns out poorly. Attorneys find jobs with the government, small companies and other places where they could be happy, but they do not take these jobs and wind up unhappy. Their minds have been co-opted by the idea that bigger and more prestigious is better—even if it is not better for them. See There Are Only Three Reasons an Attorney Should Ever Switch Law Firms for more information. I have gotten countless attorneys jobs in firms like this and the same attorneys either (1) turn the jobs down outright or (2) get jobs with more “prestigious” law firms in big cities and choose these jobs instead. It is insane—and I see it over and over and over again. I literally see it a couple of times a month these days. Someone has worked at an ultra-prestigious New York firm, for example, and relocates to a small town and I get them a great job there: A job with nice people, where the work is steady and where the attorney could easily spend the rest of their career. Sure, the job pays $125,000 a year and not $275,000 a year, but you can also work normal hours and buy a nice house for $150,000. I really do not understand this logic. You are still working and found a group of people you can work with your entire career. Just because you are no longer going to be working in one of the most aggressive and highest paying firms on Earth does not mean you have to quit rather than accept something less. But this is what people do all the time. They quit because anything less than one of the largest firms in the country is something they consider a step down. One New York attorney I know spent years trying to get a job doing white collar litigation. I finally got him a job doing this with a small law firm paying around $100,000 a year in the suburbs of New York. One of his friends from law school got him a job doing general litigation in a giant New York law firm (more prestigious than his current huge, New York law firm) for $170,000 a year. He took his friend’s job—even though it was exactly what he did not want. “How can I turn down a firm with that name?” he told me. He is now working as a part-time document review contract attorney and has been for years. He hated the large law firm, and after two years of billing 2,500+ hours per year between commutes back and forth to his $3,500/month studio apartment for a few hours of sleep each night, gave up practicing law completely before deciding to “return” to the practice of law as a contract, document review attorney. What would have happened to him if he had gone to the small law firm? Why did he—and countless other attorneys—make such strange decisions? Young attorneys are also faced with the added pressure of having had drilled into them the idea that it is important to be practicing law with a big name law firm (big city, high pressure and limited prospects). Faced with concerns about how they look to others, they become more concerned with how they look to others than how they feel inside. Some (wrongly) feel it will look better to others to quit practicing completely instead of continuing to play the game at a lesser firm. There is plenty of support for this idea among attorneys’ peers inside of law firms (fewer attorneys = less competition) and others who have left (people in similar circumstances love the moral support). They feel that anywhere they work will match the demands of a large institutional law firm, so they also give up practicing due to this. The substantial majority of attorneys in the United States do not work in large institutional law firms and are not under the sort of demands for time that attorneys in these law firms are. Large law firms often require massive hours out of associates, partners and others not because all of this work is necessary for advancing the clients’ interests, but because it is what makes money. Law firm profits per partner and the ability of firms to recruit associates, partners and others is almost always a function of how much money they bring in and generate—and not always the quality of work that they do and are doing for their clients. This, in my opinion, is where one of the most significant disconnects in the legal environment comes in: Work is being done for work’s sake and not because it is what the clients need to have their interests advanced. Young attorneys often see this and leave—not realizing the difference between this and doing what it takes to help a client. See The Industrialization of the Law Firm for more information. This is a crucial distinction: What is needed to help a client versus what it takes to help the law firm (or the attorneys there personally). This is a valid reason to leave some large law firms, and good attorneys often do when they conclude their clients’ interests are being harmed (they are being overbilled and taken advantage of). Someone who is motivated to help others and be a good attorney should be leaving for better pastures when they believe they can help the client more and be a better advocate in a different environment. Good attorneys want to help their clients. A final point is related to the environment you are in. You need to be with people you are comfortable with and who make you feel supported. Different groups will fit you differently. Nothing is more important to your long term happiness as an attorney than practicing law with a group of people whose culture and needs match your own. Just because you are working with people you do not like (or do not like you) does not mean you are in the wrong profession—it just means you need a better environment. Does the firm you are in right now match your culture and needs? How has this affected your career so far? See Firm Culture Matters Most for more information. All of the years and hard work that attorneys spend to get into large law firms merely gives them a “ticket” to work harder than they have ever worked before on a “big league” team. It is no different than working really hard to get on the Olympic Team and then thinking once you get on the Olympic Team you have made it—or no longer want to compete. This could not be farther from the truth. The right to be in the competition means you have the right to be there and now need to step up and prove yourself some more. The harder you work in law school and the better you do, the better law firm you will get into. The better law firm you get into, the harder you will have to work. The harder you work, the more you will advance. Do you like practicing law? Do you like the work of being an attorney? It is no different than someone who likes playing tennis, or doing anything else. Just because you do not want to do it on an industrial and massive scale does not mean you should quit it. If you truly enjoy it and are motivated by helping other people solve their problems, the stupidest thing you can do is quit – that’s idiotic. Take your skills where you are happy and can use them the way you want to. 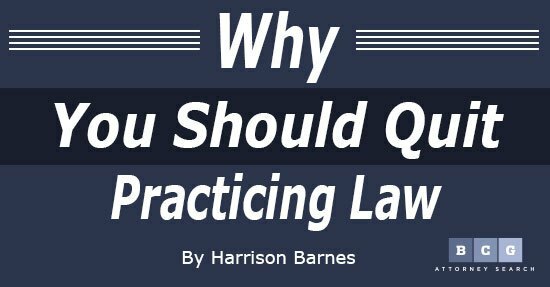 After reading this article, are you ready to quit the practice of law? Why or why not? Are you happy in the law firm you are in right now? Why or why not? What do you think are the 5 most important attributes of a good attorney? Share your responses to the above questions and any other thoughts about this topic in the comments below.